The Spanish Governor’s Palace, a National Historic Landmark, is the last visible trace of the Presidio San Antonio de Bexar and the only remaining example in Texas of an aristocratic 18th-century Spanish Colonial town house. Plans for the building originated as early as 1722. Upon its completion in 1749, the house served as the Commandancia, or residence and working office of the Captain of the Presidio. Later, it became the home of the Spanish governors who lived in San Antonio. The Spanish built the Presidio of San Antonio de Bexar to protect the area’s missions, including the San Antonio de Valero Mission (The Alamo) and the missions in San Antonio Missions National Historical Park, as well as the growing Spanish colony. The Spanish Governor’s Palace is all that is left of this important and influential presidio. Soon after the founding of the City of San Antonio by the Spanish viceroy in 1718, Martín de Alarcón, the governor of Coahuila and Texas, established the Presidio San Antonio de Bexar. This presidio served as the center of Spanish defense in Texas and as the accompanying fort to the San Antonio de Valero Mission – later known as The Alamo. The original presidio was on a site a half-mile west of the San Antonio de Valerio Mission. By 1722, however, Marqués de Aguayo relocated the presidio almost directly across the San Antonio River from the San Antonio de Valerio Mission. By 1726, there were 45 soldiers stationed and living at the presidio. The families of the soldiers and other settlers lived near the presidio as well. At the time, the total Spanish population in the area was an estimated 200. 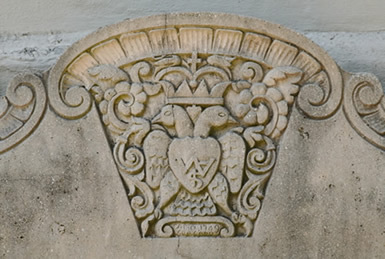 The keystone above the front entrance that bears the carved, double headed eagle from the coat-of-arms of Spanish King Ferdinand VI (or Hapsburg). Throughout the early 1800s, the Presidio San Antonio Bexar’s role as a military post slowly declined. The San Antonio de Valero Mission (The Alamo), which the Presidio San Antonio Bexar was to protect, by this time had become the main military building in the area. The Alamo would remain the principal unit of walled defense until the end of Spanish and Mexican Texas. By the early 1820s, the Presidio San Antonio Bexar’s days as a major military post were over, and it formally ceased to exist with the Mexican garrison’s acknowledgement of Texas independence on June 4, 1836. Today, the only building that still stands of the Presidio San Antonio Bexar is the Spanish Governor’s Palace. It is one of the oldest residential buildings still standing in Texas. The building is a long one-story, U-shaped stone structure covered in stucco that surrounds a traditional Spanish patio and courtyard. The building was likely finished around 1749, the date given on the keystone above the front entrance that bears the carved, double headed eagle from the coat-of-arms of Spanish King Ferdinand VI (or Hapsburg). Visitors can still see this today. Eventually, Ignatio Perez, governor of Texas from 1815 to 1817 and former Spanish captain, purchased the home, and the title remained with his heirs until the City of San Antonio bought it in 1928. Before the city purchased the home in 1928, the Spanish Governor’s Palace’s function changed from residential to commercial. Over the years, a variety of business ventures leased the building’s different rooms. At different times, the renters included the “Hole-in-the-Wall Bar,” which advertised nickel beer; a clothing store; a produce market; a tailor shop; and a school. By 1931, San Antonio had fully restored the building (attempting to preserve as much of the original building as possible) and began operating it as a Museum of Spanish Colonial History furnished with Spanish Colonial pieces. Today, visitors can tour the Spanish Governor’s Palace and its grounds and rent the building for special occasions. 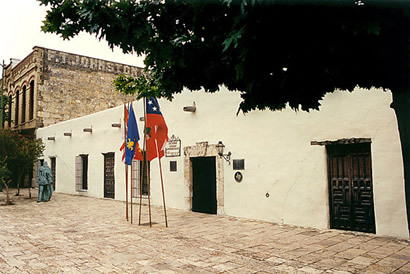 The Spanish Governor’s Palace, a National Historic Landmark, is located at 105 Military Plaza in San Antonio, TX. Click here for the National Historic Landmark file: text and photos. The Spanish Governor’s Palace is open Tuesday through Saturday from 9:00am to 5:00pm and Sunday from 10:00am to 5:00pm. For more information, visit the City of San Antonio’s Spanish Governor’s Palace website or call 210-224-0601. The Spanish Governor’s Palace has been documented by the National Park Service’s Historic American Buildings Survey, and it also is featured in the National Park Service South and West Texas Travel Itinerary.